quarterly revenue of $39.2 billion compared to revenue of $24.7 billion last year. quarterly net profit of $11.6 billion, or $12.30 per diluted share compared to $6.40 last year. Gross margin was 47.4 percent compared to 41.4 percent in the year-ago quarter. International sales accounted for 64 percent of the quarter’s revenue. sold 35.1 million iPhones in the quarter, representing 88 percent unit growth over the year-ago quarter. sold 11.8 million iPads during the quarter, a 151 percent unit increase over the year-ago quarter. sold 4 million Macs during the quarter, a 7 percent unit increase over the year-ago quarter. sold 7.7 million iPods, a 15 percent unit decline from the year-ago quarter. $14 billion in cash flow from operations. Amazingly the company generated enough cash to buy Twitter for the estimated $10B price tag while leaving $4B left to add to the coffers. Not that I see Twitter as a good purchase for a product company, but rather just an interesting view on the cash flow generation ability at AAPL. At this point, any of the options the company has mentioned for it's cash won't even cover the cash coming in the doors. Much less the $110B on the books. AAPL must have a whole department bigger than most silicon valley startups working tracking on that cash. 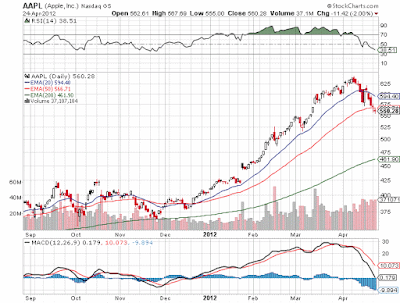 As updated 2013 estimates file in, AAPL will be trading somewhere around 8x ex cash earnings. How does it not double from here? Though I do see a $1,000 price as a potential speed bump. AAPL needs to split the stock. The below chart just makes one wonder what investors were thinking.